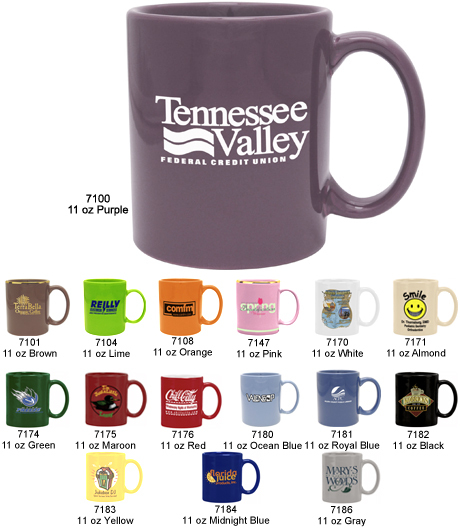 You may order custom imprinted ceramic mugs with any design, copy, and imprint colors you choose. Our custom coffee mugs are available with many vibrant color combinations. Bars, restaurants, clubs, and many other organizations use our coffee mugs. These stylish mugs also make great promotional give-always. 7100-7186 11 oz. Coffee Mug 1.92 1.79 1.72 1.66 1.61 1.56 2-5/8" 2-3/8" 7-3/8"
7100-7186 2 Day Quick Print: 11 oz. Coffee Mug N/A 2.67 2.61 2.55 2.49 2.39 2-5/8" 2-3/8" 7-3/8"
7176 11 oz. Red Coffee Mug 2.89 2.66 2.55 2.47 2.39 2.31 2-5/8" 2-3/8" 7-3/8"
7176 2 Day Quick Print: 11 oz. Red Coffee Mug N/A 3.70 3.61 3.51 3.42 3.26 2-5/8" 2-3/8" 7-3/8"
Please note: Halo, Cap and Crown Bands are not available on #7176 Red.